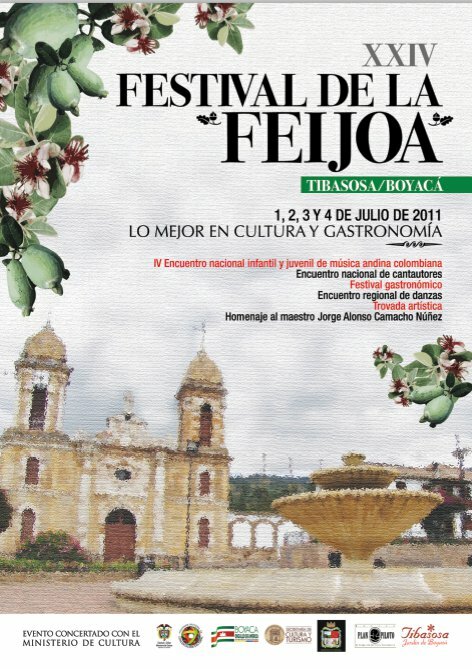 Every year in June, a small town in the mountains of Colombia celebrates the humble feijoa. Except the feijoa is not so humble in these parts. It is revered. The feijoa reigns in Tibasosa where the pueblo’s economy is based upon the funky little feijoa. There’s even an annual Feijoa festival held every June. Las Margaritas, a specialty shop produces and sells over 15 unique products made from the feijoa including Sabana a liquor, candy, pastries, ice cream, jam, cake, cookies, milk shakes and lots more. 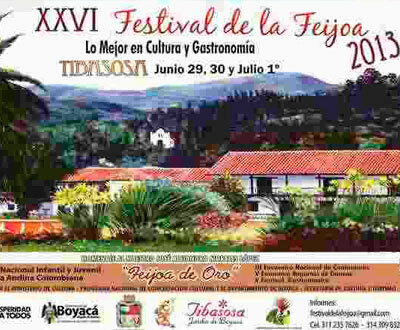 From what I can gather* Tibasosa is about three hours from the capital Bogota, situated in a picturesque and beautiful part of the Sogamoso Valley. The region boasts a rich volcanic soil that “grows everything from 302 varieties of potatoes to tomato fruit trees, papaya, chimoya, and [our favourite] exotic feijoas”. I’m still hoping to uncover a traveller’s blog that gives a personal take on the festival experience, but no luck so far. Have you been? Can you tell us more? And because they’re so lovely, here are some of the posters from this and previous years. Just love the artwork combining the distinctive town architecture with the feijoa flowers.